So, which of these looks better? The answer is that one. They're all good. It'd really depend on the environment they were place in, to see if the palette looked good. But, to my eye, I'm liking 2 and 6. The problem is, there's hardly any difference between those two. Even so, I think 6 takes the edge, for whatever subtle reason. I like this sprite though. And the size is nice. Will it be easier to animate (in terms of H-scenes) with this size of sprite? Number 3 looks best, it stands out from the others when I look at the lineup. Either 1 or 5, IMO. I'm going with 3 or 6. 3, 5, or 6. The others mainly look off to me, due to the skin tints not looking all that natural. 5 is probably my preference. #2 looks most natural/visually pleasing to me, followed by #5. #3 looks especially unnatural. But maybe I just like pale girls best? I think 1 and 2 look pretty good. Already sold on the larger sprites, then? Or are you still debating? 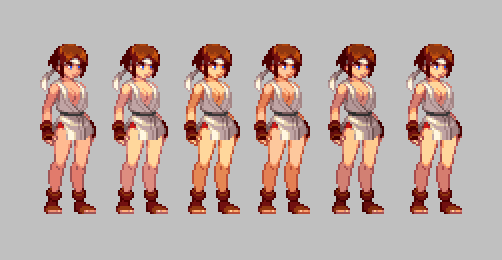 I'd still suggest the smaller (Slightly larger than Eroico) sprites! Until you have a Dev team to help with art assets. #3 and #4 look best to me. The shadow's under all the other one's knees look off to me. 3 and 4 with 4 slightly better imo. 1 looked weird for some reason i cant really define. I like body colour 2 and 5 but if you want me to pick the best, for me it is #5. It looks more like a natural tanned Skin. What would you want in a template? Square one, we meet again.